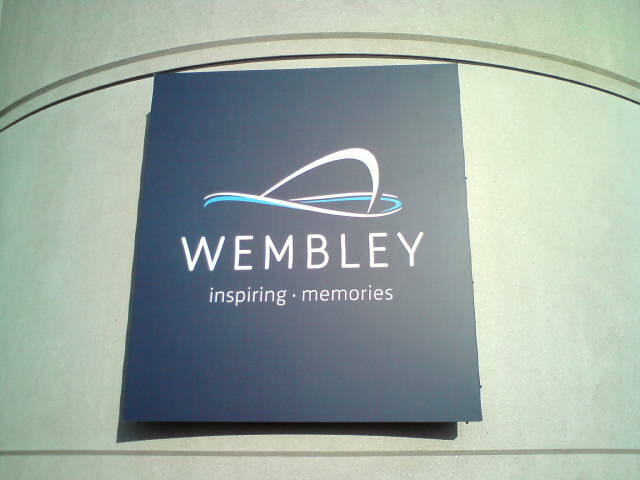 Nick and Carys had a day to remember at Wembley on Sunday 26th February with Rod and Greg Young as Cardiff City put in one of the great ‘under-dog’ performances in a Wembley cup final – taking Liverpool to penalties in the League Cup final. There were treasured days to remember with Huw at Wembley in the past and at scores of other city matches. Huw and Nick went to Wembley with family and friends, 3 times to watch the Bluebirds play in semi finals and finals, and had 3 wonderful days out. 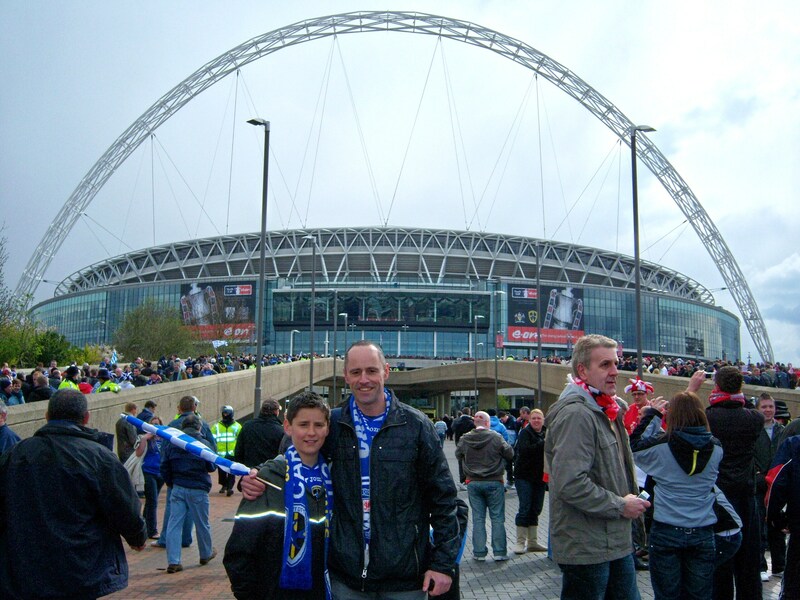 Here is Huw in 2008 outside Wembley with Nick. 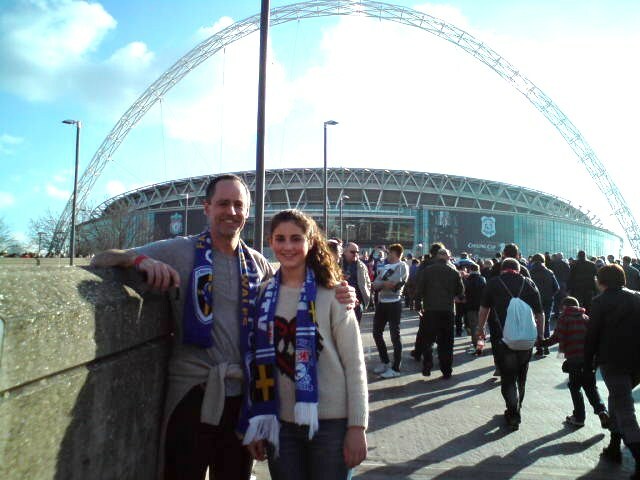 It was lovely to have Carys with me at the League Cup final in 2012. The day for us was a special one – seeing our team perform in a way that would have made Huw proud – it was also a sad day not to have Huw with us – a day of such mixed emotions. Here are Carys and Nick pictured in 2012 just near where Huw and Nick were pictured on that magical day 4 years previously. 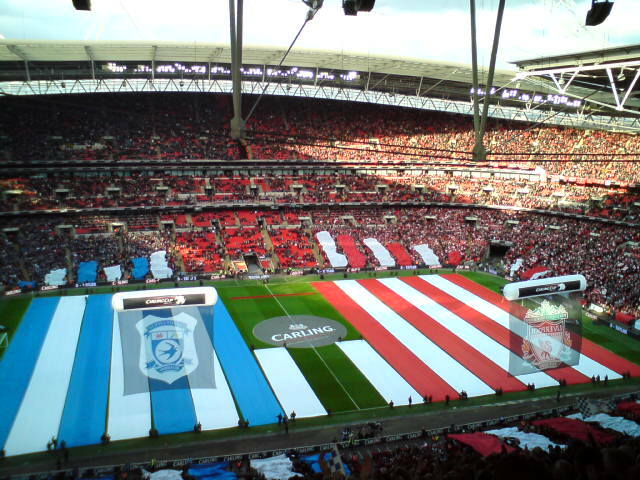 And here is the pre match build up inside the stadium with the Liverpool and Cardiff City colours alongside eachother. Colours of 2 great clubs, colours of 2 clubs that Huw adored. Colours of Huw’s Cardiff City and of Liverpool who he would have wanted to win against virtually any other club if they hadn’t been playing the Bluebirds. Watching the drama of a penalty shoot out unfold felt unreal – the number of times I sat with Huw talking about Pepe Reina and Steven Gerrard – and here they were shooting out against the Bluebirds without Huw with us. Thank you to everyone who was cheering the Bluebirds on against Liverpool – maybe people cheering the underdogs and definately people cheering the club that always brought a twinkle to Huw’s eye. 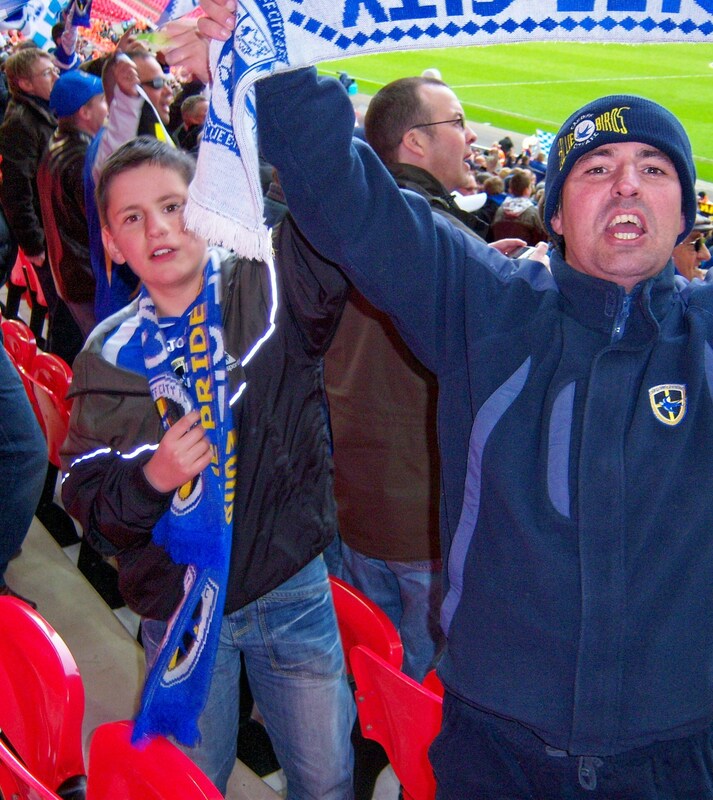 Here is Huw cheering on the Bluebirds with Uncle Steve in 2008 wearing his Cardiff City scarf. It felt like we were cheering for Huw as well as for the club he loved at Wembley in 2012 – celebrating as the team that cost £3m bravely matched their opposition that was assembled at a cost of £250m. Huw would have been so intrigued; so proud. Maybe he was with us – intrigued and proud – watching us cheer on the Bluebirds and Carys wearing his scarf – and treasuring it until we could put it back in his room at home. The League Cup final was so much more than a football match. Huw, Carys and I had some of our happiest times of recent years watching Cardiff City together – it will continue to be something that Carys and I do that makes us feel close to Huw. A Bluebird flying in the sky, a Bluebird in our hearts. And here are the words of a beautiful song – click the link at the end. And I’ll never know why.